Virginia has opened as a narrow favorite against Texas Tech in Monday night's national championship. The Superbook currently has the Wahoos as a 1-point favorite against the Red Raiders with an over-under set at 120. Seeing a total that low shouldn't be a huge shock after a historic semifinals where all four teams scored under 65 points for the first time in the shot clock era (1986). Texas Tech ranks as the best team in the country in terms of defensive efficiency, and Virginia not only carries a top-five defensive ranking but has been the class of elite defensive basketball for much of Tony Bennett's tenure. No matter what coach wins on Monday night, there will be a new addition to the list of active head coaches with a national championship. While Tony Bennett has been one of the "best coaches not to make a Final Four" for the last handful of years, Beard has been a flash in the sport the likes of which we have never seen. His assembly of an Arkansas-Little Rock team that not only made the NCAA Tournament but won its first game led to the job at UNLV, which quickly became the job at Texas Tech, and now the Red Raiders have broke down barrier after barrier with Beard. Year one was the first-ever Elite Eight, year two now has not only the first Final Four appearance but a shot at a national title. 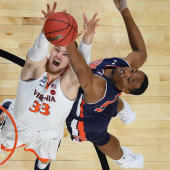 Bennett carries similar weight in that light, holding a chance to win the program's first title in his first Final Four appearance, which has been Virginia's first Final Four since 1984. Virginia's De'Andre Hunter vs. Texas Tech's Jarrett Culver: Look no further than the two top NBA prospects on the court. Both Hunter and Culver were clearly the top options during key second half possessions of Saturday's semifinals, and the two wing forwards could end up matched on each other in similar situations on Monday night. Kyle Guy made the last six six points and Ty Jerome got things started for the Wahoos, but Hunter had the ball in his hands for several of those last key possessions. Similarly, it was Mooney who got things moving for the Red Raiders but Culver who was needed to seal the win down the stretch. In a game with a total of 120, you know that the physicality and toughness that Texas Tech used to win the mental battle against Michigan State is going to be the slim margin of error for the narrowly favored Wahoos. Virginia is going to need more than excellent execution, it's going to need to bring the fight on Monday night. No. 1 seed Virginia survived against No. 5 seed Auburn 63-62 in the Final Four, thanks to three Kyle Guy free throws with 0.6 seconds left. Ty Jerome was the star of the game, recording 21 points, nine rebounds and six assists. De'Andre Hunter also chipped in 14 points on 7-of-11 shooting. Virginia's bench isn't deep, but any of its starters are capable of putting up big offensive performances. In five tournament games, Virginia has had four different leading scorers.